Celebrating over 25 years of worldwide sales to countless satisfied customers! You have found the most effective, safest and by far, the least expensive treatment in the world for ALL tinea fungus conditions. Blemaquit® is, without a question, the best treatment in the world for Athletes Foot and Jock Itch. Blemaquit® was invented over 30 years ago as an all natural, 100% effective alternate treatment from expensive oral prescriptions, which have been proven to cause kidney and liver damage. Thank you to the thousands of our dedicated clients and for spreading the word about how good Blemaquit® really works compared to others. At this time we had to raise our price for the 1st time in ten years by only two dollars. We will always strive to be far less expensive then all others, With one significant point that all should know. However Blemaquit® is also without question the best treatment in the world for Athletes Feet and Jock Itch, Guaranteed! The current available over the counter treatments require spraying on multiple times per day for a week or more? Yet this just puts the fungus in "check" NOT with Blemaquit®, With one application for moderate conditions,two at most for even advanced conditions the fungus is now dead.Period! 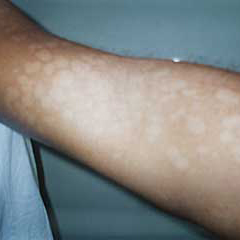 We have a 100% customer satisfaction policy for all purchases, After 25 plus years of world wide sales not one single customer has ever asked for a refund,with the exception of only one client who thought his vitiligo was tinea versicolor. 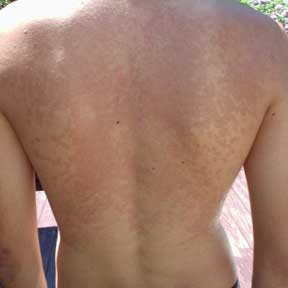 Sun spots appear as patches of white, brown or light pink, finely flaking skin. This unsightly condition may spread over the entire body including facial areas. These blemishes may also itch and burn. 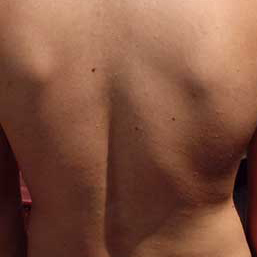 After a single application of Blemaquit®. 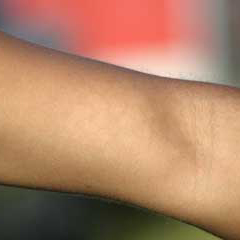 noticeable improvement begins and usually, in about 10 days, affected areas will begin to blend in or tan. In non-clinical studies, Blemaquit® was also shown to be effective on athlete's foot (tinea pedis) and jock itch (tinea cruris). That's all there is to it. You will see the results! Before using Blemaquit® After 1 or 2 overnight applications, the fungus is dead..Period! Skin type dictates how long it will take to achieve complete restoration of your normal skin tone. The lighter your skin the longer it takes ( allow 3-4 weeks) Darker the skin usually recovers in 1-2 weeks. No matter what skin type you have, you need to get Proper UV exposure for the spots to blend back in. It is important to use a quality sun tanning product, ie. dry tanning oil or Bain De Soleil with a spf factor for your skin type. Do not try to tan back all in one or two sessions or the areas will burn. Each jar of Blemaquit® contains enough product for 2-3 applications covering complete back and or chest treatments. We suggest that if Face treatments be done during the day leaving it on 4 to 5 hours for proper treatment. Do not sleep with the product close to the eyes as it might cause irritation. Treating Athlete's foot (tinea pedis): Apply at night after shower, use an old pair of socks to cover feet. 1-2 treatments is all that is needed. Treating Jock itch (tinea cruris): follow the instructions for athlete's foot using underwear to cover. Wash garments separately or discard. "I would like to THANK YOU for creating this product. When my boyfriend and I first discovered what he had and the doctor told us we just need to let it "run it's course" we felt as if it was hopeless. After finding and receiving your product and applying one treatment - 5 days later we saw a great improvement and now 9 days later, it's practically gone. We wish we would have taken before and after pictures so that you can see the effect it has on African-American skin. At any rate, we are extremely happy with the results and will be ordering more in case it ever flares up again. Thanks again for creating this remarkable product!" " Until now there has been nothing available over the counter that effectively and safely treated my condition" Thank You !" "I just wanted to share with you the pictures of the results of my son. I also wanted to say thank you. I can't believe how easy it was. We tried so many products from prescription to over the counter creams... None worked. I will look forward to telling others of your wonderful product.Please feel free to share these pictures." "For years I have attempted to find a cure for my tinea-versicolor. I tried numerous natural remedy's. NONE worked. Then, I went to the dermatologist and was prescribed medicine that did NOT work and is very BAD for your liver. The dermatologist said there wasn't anything else that I could take. I found BlemaQuit® on line and it really WORKS! It is the most effective product I have ever used for tinea-versicolor . My skin looks great and I am not embarrassed to go outside in summer time. I am relieved to find this product after going years of trying to find a solution. I am so happy I finally found product that works!!!" Just pat it on once! BlemaQuit® gets rid of sunspots. No other over-the-counter product can make that claim. If product contacts the eyes, rinse thoroughly with water. Call physician if irritation persists. Do not use if you are allergic to products containing sulphur. BUY NOW $15.95 or BUY 2, GET 1 FREE! For more information on Blemaquit®, complete the form below and one of our customer service representatives will get back to you.